An accident involving a motorcycle and pick-up truck occurred this afternoon on Spillway Road near Regions Bank. Emergency personnel were dispatched to the scene at 2:40p.m. Reservoir personnel assist the rider of the motorcycle. A witness told TRN the truck was exiting from the Regions parking lot and was hit by the eastbound motorcycle. 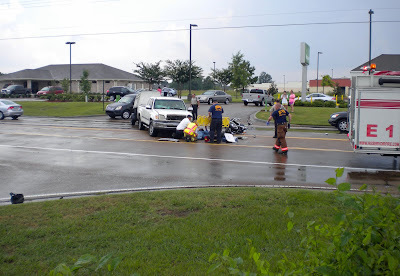 The rider of the motorcycle was transported to the hospital, the extent of his injuries are unknown at this time. The driver of the truck remained on the scene and did not appear to be injured. so you are saying this is the motorcyclists fault? Sounds like the truck pulled out in front of the motorcycle. It seems unlikely that the motorcyclist would somehow not see the truck and run into it. Leave it alone. A man is hurt! Who cares how it happened. No one in this thread knows what happened. Who cares what happened. A man was hurt and he was treated and sent to the hospital and is still in pretty rough shape. It is not our place to judge any of that. Let those in charge of doing that do so. And yes, I was there. I am actually in one of the pictures but I will not say who. That area is so congested. With the Regions exits, Spann drive, the exits on either side of Fresh Market, etc, traffic gets crazy there. I saw a truck pull out of Regions and try to go straight across all 5 lanes in heavy traffic. Make the block people. It's much safer! Prayers for the motorcycle rider and his healing. Please pray for his family. The man on the bike is an exceptional father of four young boys. He is a happy guy that works hard and is a fine man. Please pray for his recovery. Anyone thinking this accident is the motorcyclist's fault should seriously stay off the road. When turning out INTO traffic, you make sure it is clear FIRST!!! The truck failed to do this.Pulling onto Spillway requires Spillway to first have space for you. Hmmm, this driver didn't take the time to check. The road is just as much for cycles as for cars, the driver of the truck failed to look. Period. REALLY??? There is someone who believes this could be the motorcyclists's fault??? Learn the rules of the road. Before you pull out to turn, IT MUST BE CLEAR FIRST! 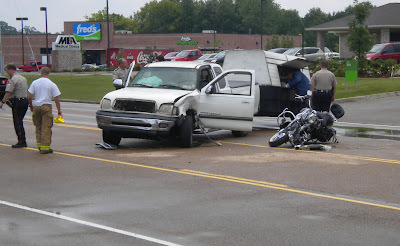 Truck clearly pulled out right in front of motorcycle. Pray for this family, and thank the sweet Lord daily it was not your own! Hmmm, truck pull out from bank, INTO traffic. Traffic has right of way. Doesn't take a diploma to figure that out. i USED to ride a motorcycle but sold it last yeaqr be cause there are TOO MANY IDIOTS on the road. It everyone road a bike or a horse, there would be A LOT FEWER wrecks. With all the protection around people in vehicles, they don't take the time to see if anything smaller than a semi is headed their way.